The Riff Machine generates melodies in the Piano roll (depending on the settings made in the tabs). 1. Progression - A series of long notes are selected according to the general mood you desire. 2. Chords - The note series is transformed into chords ready for the Arpeggiator step. 3. Arpeggiation - The chord is chopped up and arpeggiated to create a basic 'riff'. 4. Mirror - Vertical and horizontal transformations of the arpeggio are made to add interest. 5. Levels - Note parameter levels are randomized (to a user specified degree) to add variation. 6. Articulation - Note lengths/transitions are varied to change playing 'style'. 7. Groove - Note quantization is varied to add rhythmic feeling. 8. Fit - Note range and key is specified. Notes created by the Riff Machine have the length of the current Piano roll snap. The Length and Variation controls won't work if SNAP is set to '(none)'. Any or all tabs can be selected or deselected to play a part in the final 'riff'. Some settings on some tabs will defeat those on others (setting a compatible combination is up to the user). 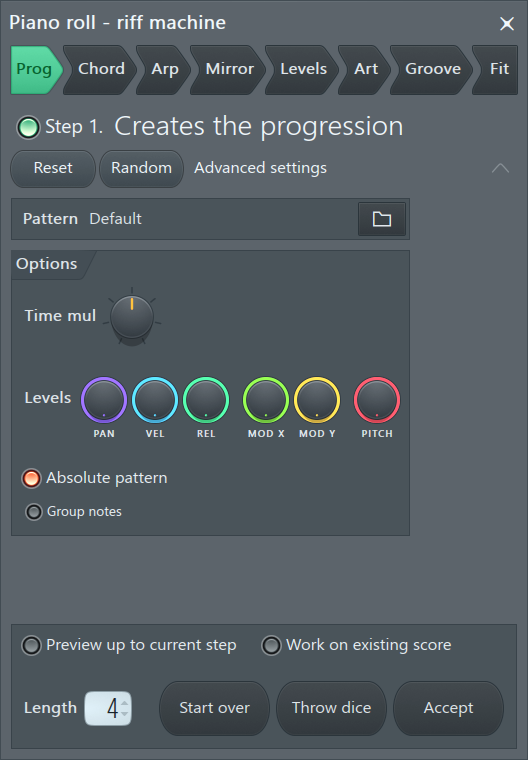 Preview up to current step - Play the riff generated by the settings up to, and including, the current tab. Work on existing score - Apply the settings to the score in the Piano roll before the Riff generator was launched. Length - Number of bars the riff should cover. Start over - Reset all steps. Throw dice - Generate a new riff with new random seed settings. Accept - Accept the current riff.